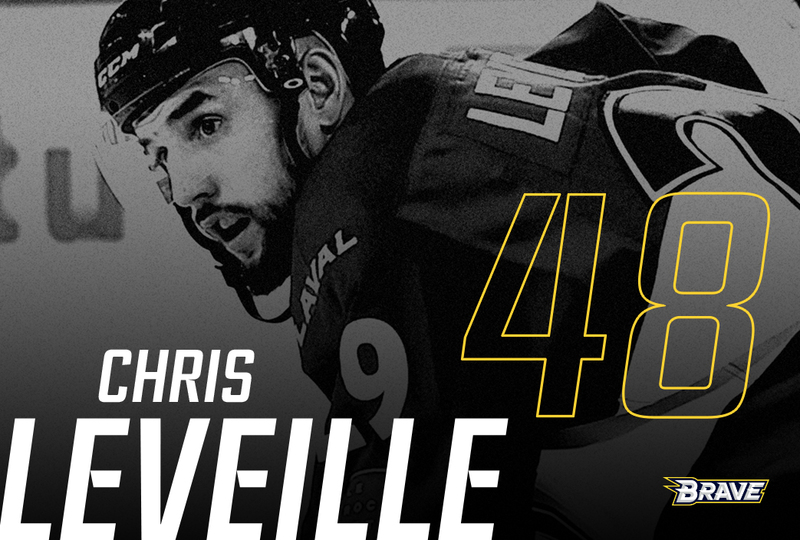 The CBR Brave are delighted to announce the signing of savage sniper Chris Leveille from the East Coast Hockey League (ECHL) Bramton Beast, the ECHL affiliate of the Montreal Canadiens. Leveille has had a storied career to date including an ACH championship with the Brantford Blast in 2013/14, and an FHL Championship with the Port Huron Prowlers in 2015/16. Leveille is also a 2-time First Team All-Star in the SPHL and in the 2010/11 season he won the SPHL Most points award with 76 points (33G-43A) in 56 games played. The Guelph, Ontario Canada native started his professional career in 2008 with the Fayetteville FireAntz in the Southern Professional Hockey League. He played for Fayetteville for 4 seasons, where he served as captain for the 2011/12 season. During his tenure with the FireAntz, he topped the scoring for Fayetteville in both the 2010/11 and 2011/12 seasons and was the league leader for points scored in 2010/11. During his time in Fayetteville, Leveille scored at a blistering 1.19 point per game pace! At this point in his career, Leveille decided to take a step back from the rigors of professional hockey to focus on family. Leveille joined the Williamsport Outlaws for the 2012/13 season before the league took ownership due to financial issues. He then joined the Dayton Demons for the remainder of the 12/13 season. Following the 2012/13 season, Leveille joined the Allen Cup Hockey’s (ACH) Brantford Blast through until the 2015/16 season. During this time, Leveille and the Blast secured the Allen Cup in the 2013/14 season. After taking the time to recharge, Chris decided that it was time to tackle a new challenge. He answered an open tryout call by the Brampton Beast of the ECHL, and after working day and night he secured a spot on the opening day roster. To this day he is still the only player in Brampton Beast history to make the opening day roster from an open tryout. His hard work and determination has continued to pay dividends as he earned a 6 game call up to the Montreal Canadiens AHL affiliate, the Laval Rockets. Chris brings a wealth of experience, a proven ability to score prolifically, speed and the ability to create time and space to the CBR Brave.